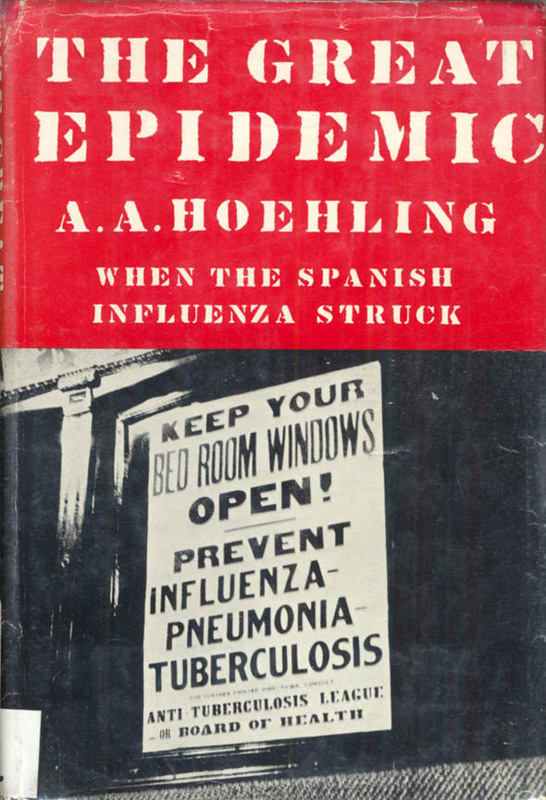 The search continues for the origin of the Spanish Flu Patient Zero narrative. Every time I read the story — and it’s ubiquitous — there’s the same cluster of details with nary a citation of the source. Albert Gitchell, or in some accounts Mitchell, was a cook at Camp Funston (or Fort Riley), Kansas, who fell ill on March 11, 1918 (in some accounts March 4) and reported to the infirmary first thing, followed shortly by others named, and then a hundred, all with the same complaints of fever, lassitude and headaches. Seeking the earliest mention of Patient Zero Albert Gitchell, I have in hand what I believe to be the first general history of the pandemic, The Great Epidemic: When the Spanish Influenza Struck by A. A. Hoehling (Boston: Little, Brown & Co, 1961). On Monday morning, March 11, before breakfast time, the duty sergeant at Hospital Building 91, once host to the sickened backwash of the Spanish-American War, had a caller. Albert Gitchell, a company cook, complained of a “bad cold.” He was feverish, suffered from a sore throat, headache and muscular pains. Gitchell was quickly banished to a contagious ward. Hardly had a corpsman put a thermometer in the soldier’s mouth when Corporal Lee W. Drake from the First Battalion, Headquarters Transportation Detachment, reported to the same admitting desk in Building 91. His symptoms, even to a 103° fever, were identical with Gitchell’s. Two cases with a rubber stamp similarity could have been coincidence. However, when Sergeant Adolph Hurby came coughing in moments later, the duty corpsman called for the chief nurse. By the time Lieutenant Harding had arrived at Building 91 two other sick soldiers were awaiting admission. Miss Harding knew she was confronted with a potentially grave situation. She cranked the wall phone. ‘Colonel,’ she commenced with concern. Fever 104°. Low pulse, drowsiness and photophobia. Conjunctivae reddened and mucous membranes of nose, throat and bronchi, evidence of inﬂammation. 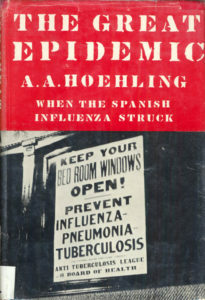 There was little doubt in Dr. Schreiner’s mind that the Army post had been hit with inﬂuenza. By noon, 107 patients had been admitted to the hospital. Surgeon Schreiner figures nowhere in the Acknowledgements or Bibliography sections of the book. Yet how boldly he is drawn! including the workings of his mind! Is that what is called creative non-fiction? But there is nothing there that could not be realized with the aid of Col. Schreiner’s picture and someone’s description of his behaviour; likely also his correspondence on the state of the camp. Nurse Harding does show up in the “indebted to the following people” section at the back of The Great Epidemic. Even though there’s no mention of hospital admission documents, I conclude that the writer engaged his flair for drama to work up some hospital admissions document. Thus far I haven’t been able to get anywhere near such a document. Or to Dr. Schreiner. A history of Fort Riley hospital published in the 1950s(1) relates that Elizabeth Harding attained the rank of Lieutenant-Colonel. In a letter extensively quoted,(2) Harding related that she arrived at Fort Riley in a snowstorm in October 1917 and suffered the utmost privation that winter, along with thousands of doughboys. She was there when the spring wave of epidemic influenza struck but, tellingly, doesn’t mention it — meningitis was of the greatest concern. Which suggests to me that she was not the source of the Gitchell story that The Great Epidemic recounted three years later. Sixteen nurses down in one camp. The brutality of the epidemic is inconceivable. Strange to relate, in Albert Gitchell’s personal and family history in online records, there is not the merest mention of the Patient Zero narrative. * Nor, to be candid, could I find anything that directly links the person I found online to Camp Funston. I do find an Albert Martin Gitchell working in food-and-drink-related occupations before and after the war, and I believe that man to be the Albert Gitchell, a cook at Camp Funston who famously got sick on March 11, 1918. * Documents accessed via ancestry.com; news articles with the newspapers.com search engine. The draft registration card for Albert Martin Gitchell reveals he was born in Chicago in 1890 and was in 1917 a self-employed butcher living in Ree Heights, South Dakota. His father, Albert W., was a plumber (1910 census), and his grandfather William, a carpenter; Albert’s mother Ellen was from Norway. On his military gravestone are carved Albert’s rank, Sergeant; his unit, 9 Co[mpany] 3 B[attalio]n, 164 Depot Brigade; and his service in World War I. 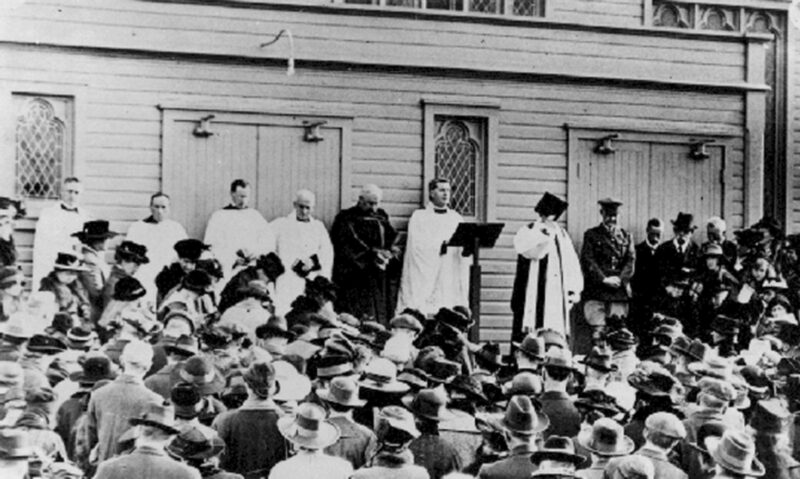 A 1919 record memorialized Albert’s marriage to Emma Van Gorp, a widow; both residents of Ree Heights. The 1920 census for Ree Heights Township identifies him as a restaurant proprietor and Emma as the daughter of immigrants (elsewhere named Puffer) from Bohemia (now Czech Republic). The Gitchells apparently lived in a Bohemian enclave. For a time they lived in Binghampton, New York. In 1930 Albert was a commercial traveler for a gas and electric company there, and Emma worked at film casting in a factory. A 1935 issue of the Huron, SD Daily Plainsman reported that A. Gitchell of Ree Heights was issued a high point beer license. In 1945 the Gitchells moved to Sturgis, SD, where they operated a neighbourhood store until 1951. The Gitchells evidently did not have children. 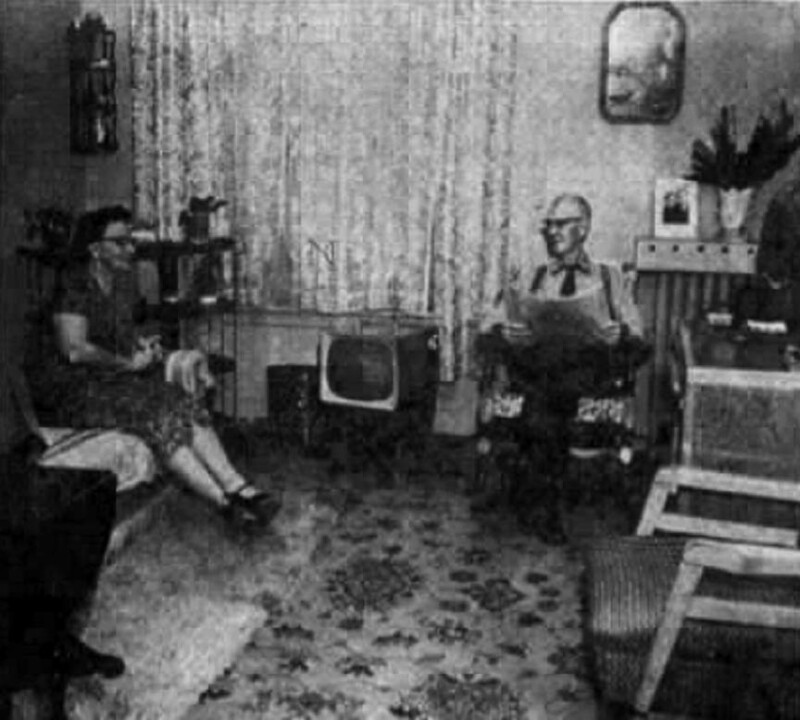 A spread in the Rapid City [SD] Journal of November 30, 1958 featured the South Dakota State Soldiers’ Home, where Mr. and Mrs. Albert Gitchell were depicted in their suite. Albert died in 1968. Emma lived at the State Home until her death in 1977. After The Great Epidemic was published in 1961, a syndicated review of the book by William R. Lansberg appeared in small-town New York newspapers; it mentioned Patient Zero Albert Gitchell. After that the earliest newspaper account I could find was an article in the September 6, 1976 Dayton, Ohio Journal Herald, “20 million died in 1918-’19 outbreak. Swine flu resurrects fear of pandemic.” The writer of that, Hugh McCann, of the Detroit News, demonized Gitchell, claiming he “won immortality as the man whose sneeze went around the world, causing the worst plague in the history of man.” The next mention of Patient Zero Gitchell I could find was in March 1998, in a staff-written story in The Manhattan [Kansas] Mercury. Since then, the floodgates have definitely opened. Albert Gitchell has had way more than his fifteen minutes of fame. But immortality? C’mon. Anyway, doesn’t membership in the Patient Zero club have the same high bar as a Darwin Award, namely you have to be dead? If one thing is clear in all this, it’s that the origin of the Spanish Flu virus and the identity of Patient Zero will always be mysterious. * “Pneumonia at Camp Funston. Report to the Surgeon-General,” by Eugene L. Opie, Allen W. Freeman, Francis G. Blake, James C. Small and Thomas M. Rivers. [All M.D.] Journal of the American Medical Association 72(2), January 1919, pp. 108-116. Downloaded from JAMA Network. In their report is a chart showing day-by-day admissions to the Fort Riley hospitals for influenza. 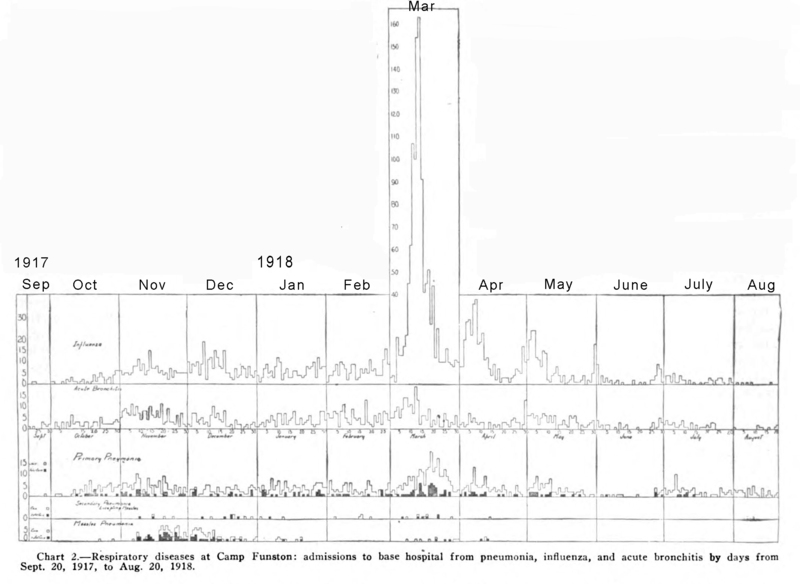 Admissions for influenza were on the rise a week before Mr. Gitchell showed up. Published August 28, 2018. Most recent edition December 9.